A Hybrid Perpetual ‘Baronne Prevost’ has highly-scented, very double, cerise pink flowers and produces a vigorous shrub which grows to 2m or more. Rivers described it as an old sort still well worthy of cultivation. [Paul (1848, 1863, 1888, 1903), Rivers (1854, 1857, 1863), Henry Curtis p. 9 vol.2/1853]. Introduced by Desprez of Yèbles in 1842. 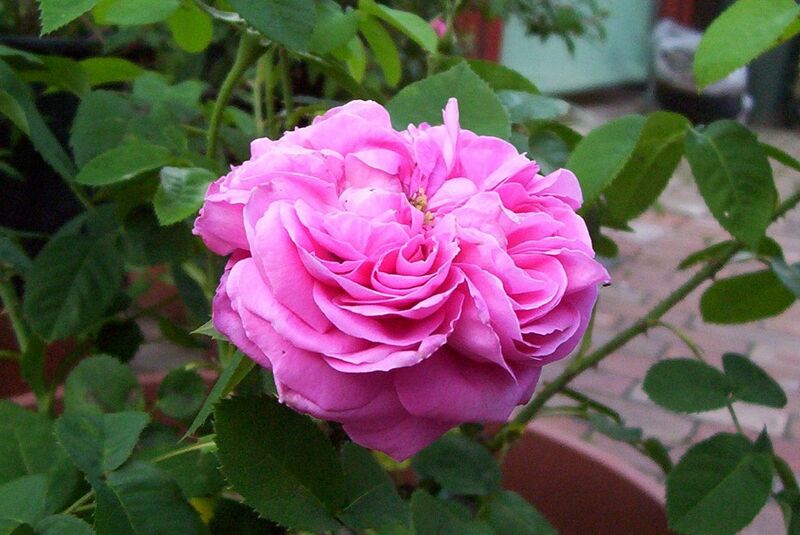 It was recommended as a pot rose in The Gardeners’ Chronicle. ‘We know of no rose so large and fine, and it is as sweet as the old cabbage’, reported The Gardeners’ Chronicle of 1849, in an account of a visit to Lane’s Nursery. [Gard. Chron. 1847, 1849, 1856, 1858]. In my garden it is a reliable, if somewhat sparse, flowerer. Louis van Houtte included ‘Baronne Prevost’ in an Énumération des plus belles variétiés et….des autres!, all Hybrid Perpetuals, in the Flore des Serres. [FS. pgs. 91-102 vol. 15/1864]. In the first great National Rose show held in July 1858, ‘Baronne Prevost’ featured amongst the roses appearing in multiple (15) winning collections. [Gard. Chron. 1858]. Listed in the 1850 and 1857 catalogues [T.885/1850]. Obtained from Veitch’s Nursery and Kew Gardens in the same importation as ‘Narcisse’. Believed to be new to the colony. [ML A1980-3]. Rosa 'Baronne Prevost' | Photograph Colin Mills, taken in the author's garden.